Southwest Alaska has seen North America's largest recorded earthquakes and largest documented volcanic eruptions. Now, a team of geologists will deploy a vast array of seismometers along the Alaska Peninsula in an experiment they hope will solve long-standing mysteries about the region and about earthquakes and volcanoes in general. Funded by the National Science Foundation (NSF), the $4.5 million Alaska Amphibious Community Seismic Experiment involves nine research institutions, including UC Santa Cruz. Susan Schwartz, UCSC professor of Earth and planetary sciences, is one of 10 principal investigators for the project, which is led by Geoff Abers of Cornell University. Schwartz was also a principal investigator for the first community seismic experiment, the Cascadia Initiative, which targeted the Cascadia subduction zone off the coast of the Pacific Northwest. An array of land and ocean instruments built for that experiment, called the Amphibious Array Facility, will now be redeployed in Alaska. Offshore from the Alaska Peninsula is a subduction zone where the Pacific and North American tectonic plates collide. Ninety percent of all U.S. earthquakes occur here, and it’s the only location in North America where magnitude 8 and 9 earthquakes have been recorded. Most of the continent’s known volcanic eruptions have occurred along this subduction zone as well. Despite being such a geologically active area, the remote region hasn’t been monitored very well, especially at the ocean bottom, according to Abers. 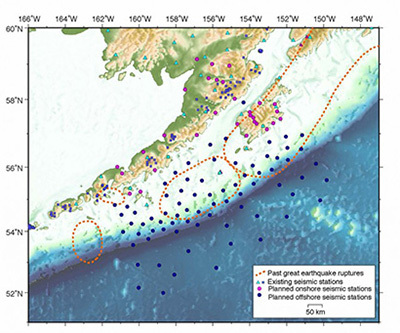 The seismic experiment will scatter 105 high-end seismometers off a 435-mile-long stretch of the peninsula’s coast that includes the communities of Kodiak, King Salmon, and Sand Point. Broadband seismic equipment will be buried on various islands and ocean-bottom seismometers deployed as far offshore as 300 miles. The array will cross the Aleutian Trench marking the plate boundary where the Pacific plate dives beneath the North American plate. Another mystery geologists will examine is why one particular stretch of the subduction zone hasn’t recorded a major earthquake in the last several decades while every other stretch has. “Is there something different about the character of the seafloor here that might help us understand why? Is it a much smoother sea floor or do the faults go deeper?” asked Abers. 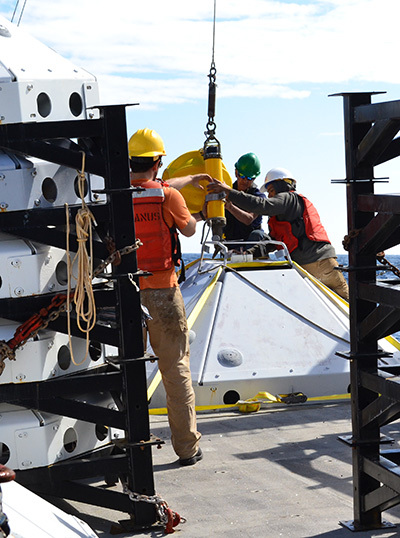 The researchers have mapped the best drop location for each seismometer and Abers is coordinating a deployment schedule with a fleet of research ships. He also worked with Alaskan land owners, educators, and pilots to negotiate land-based locations. The seismometers are scheduled to be deployed in the spring of 2018, with the goal of beginning recovery efforts in the summer of 2019. It won’t be until then that the data can be collected and provided openly to the entire science community. “There’s a lot of excitement and anticipation for the data,” said Abers. Schwartz explained that community experiments use community resources, involve a consensus on the science objectives, and provide immediate open access to the data. “The idea is pretty new to the geophysical community and it has lots of advantages, especially for young scientists who get immediate access to great data,” she said. Other institutions involved with the project are Colgate University, the U.S. Geological Survey, the University of Washington, the University of Colorado, Columbia University, Washington University, St. Louis, and the University of New Mexico. 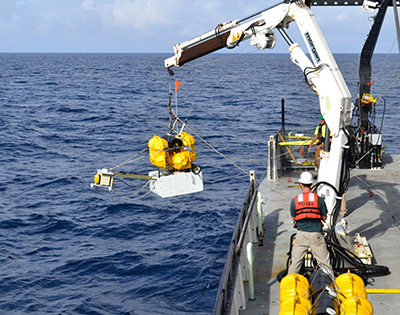 Ocean-bottom seismometers are provided by the Woods Hole Oceanographic Institution and Columbia University’s Lamont-Doherty Earth Observatory.